The U.S. and South Korea this month are performing joint exercises, which according to one report, include F-35 jets and the famous U.S. Navy Seal Team Six. The North, an isolated and communist regime headed by the Kim family dynasty, sees the exercises as preparation for war. North Korea has carried out several nuclear tests and a string of missile launches since last year. Just last week, it fired off four ballistic missiles into the sea off Japan in response to the joint U.S.-South Korea drills. Meanwhile, autocrat Kim Jong Un’s brother, Kim Jong Nam, was assassinated in Malaysia last month. “If they infringe on the DPRK’s sovereignty and dignity even a bit, its army will launch merciless ultra-precision strikes from ground, air, sea, and underwater,” North Korea’s state news agency KCNA said, according to Reuters. The DPRK (Democratic People’s Republic of Korea) is the official name for North Korea. 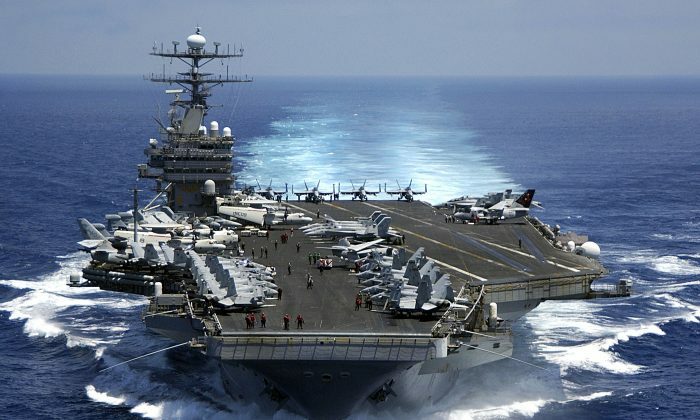 F-18 jets took off from the nuclear-powered carrier, the USS Carl Vinson, in seas off South Korea on Tuesday, Reuters also reported. “On March 11 alone, many enemy carrier-based aircraft flew along a course near territorial air and waters of the DPRK to stage drills of dropping bombs and making surprise attacks on the ground targets of its army,” KCNA added. U.S. officials stressed it was routine. “While this is a routine deployment for the Carl Vinson strike group, really the centerpiece for us … is this exercise we’re doing with the ROK navy called ‘Foal Eagle’,” U.S. Rear Admiral James W. Kilby, commander of the Carrier Strike Group 1, told reporters. “It will send a very strong message to North Korea, which is constantly carrying out military provocations,” a South Korea ministry official was quoted as saying by the news outlet.